Since 1992, Marcia has been delighting hundreds of brides in the New York metropolitan area with her stunning handcrafted custom headpieces, veils, and jewelry. After graduating from Cornell University with a degree in apparel design, Marcia began her long career in the garment industry, first as a retail buyer, and later as a designer, merchandiser, and division head. Her busy job sent her traveling the world creating clothing for both retail chains and garment manufacturers. After eighteen years of this demanding and hectic lifestyle, and in an effort to spend more time at home with her family, she decided to open a small business of her own near home. Both her talent and creativity led her to her new career. In 1992, The Sequin Garden was born; a lovely little wedding boutique in Bergen County, New Jersey. 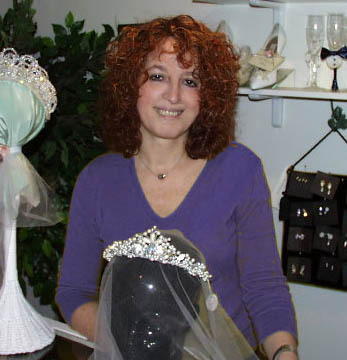 Though the shop featured extensive wedding accessories and floral arrangements, Marcia's passion was custom-designing bridal headpieces and jewelry. She quickly became recognized and sought after for her exquisitely designed headpieces and veils, which are individually made with artistry, precision, and tender loving care. In 2001 Marcia decided to offer her designs to a broader audience by creating HeadpieceHeaven.com and in 2004, has added "Something Old, Something New Jewels" at www.VintageBridalJewelry.com to her company. You will feel totally confident and comfortable putting your faith, and your bridal headpiece and jewelry designs, in the hands of Marcia and her design staff. Marcia is easy to work with and thoroughly enjoys her craft. You will definitely love working with her, and we promise that you will love your headpiece, veil and jewelry even more! so that we may be able to best serve your needs! We will respond within 24 hours with pictures and prices!